Words are not enough to describe the visceral feelings that Transformalin delivers, but this sound-therapy will cure your soul or make you total sick! This project’s sole member is Nattramn, whose ‘Death—Pierce Me’ album under the project name Silencer stand as defining work in the suicidal black metal movement. Diagnose: Lebensgefahr is significantly different from either, though, and should not be considered a black metal album as such. For the first time this album blew up the world in 2007 and now it's still one of the most interesting works on current scene. 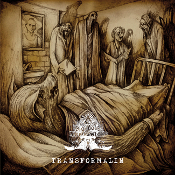 Transformalin is a bleak voyage through related genres, particularly dark ambient, power electronics, martial and noise-influenced industrial, with black metal serving as the filter that taints and completes them. Consequently, ‘Transformalin’ is a jarring experience that can be harshly rhythmic at one moment and the next dive into unmetered, dragging ambience, while still others draw on martial cadences and horn reveries that echo in the background. Though mostly instrumental, he does provide ‘narration’ from time to time with primarily clean vocals that range from manically impassioned to psalm-tone catatonia. Last years it became extremely rare album and now, 5 years later, this black pearl is available again! This time with the expanded booklet on 16 pages which was specially developedover by the well-known artist Costin Chioreanu (drawing for Grave worked; Darkthrone; Demonical; Aura Noir; My Dying Bride; Arcturus, Trencadis; Arktau Eos and many other). Masterfully executed, under the sensitive management of Nattramn'a, drawings, are your silent conductors on desert corridors of Diagnose: Lebensgefahr. Jewelcase edition with 16 page booklet.